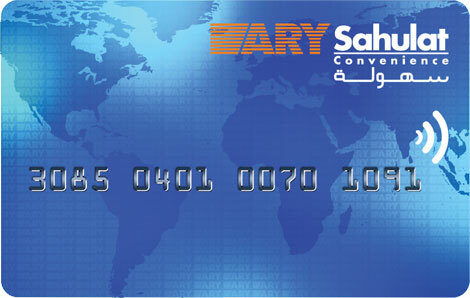 Make Transaction With ARY Sahulat Card And Get Upto 100% Value Back. What Is ARY Sahulat Wallet? ARY Sahulat Wallet is not a cheque, credit card, debit card, or any other charge card. Members can deposit upto Rs. 50,000/- via single transaction to his/her Sahulat Wallet. If ARY Sahulat Wallet is not used for a consecutive period of 12 months - whether to make a purchase or top-up - it will automatically expire at the end of that period. When you use ARY Sahulat Wallet, the amount of your purchase will be deducted from your balance on Wallet. Refunds or credits for goods purchased with ARY Sahulat Wallet will be reverted back to your ARY Sahulat Wallet account. Members may obtain information about their remaining balance on ARY Sahulat Wallet any time by logging into their online account. Members can only redeem their ARY Sahulat Wallet balance in the currency of deposit. All refunds of goods or services purchased with ARY Sahulat Wallet will be made in accordance with ARY's sahulat bazar Refund Policy. This does not affect members' statutory rights. ARY Sahulat Wallet will cancel the order if we fail to receive payment from the purchaser's bank or card Company for initial purchase of ARY Sahulat Wallet. Further action may be taken where any fraudulent use is suspected. ARY Services Limited reserves the right to share transactional information with any law enforcement body; if requested. Copyright ARY Services (PVT)Ltd All Rights Reserved.